The bitcoin popularity is surging. Even with people who don’t exactly know what it is, know of its prominent existence worldwide. This was testified when the 2017 edition of the annual ‘Top 50 Report’ of Wikipedia showed that Bitcoin stands as ninth most-read article on the digital encyclopedia for last year. The entity Bitcoin, came ahead of of cultural sensations like Wonder Woman, Elon Musk, and Star Wars. The first eight spots on the annual list went to articles that included Game Thrones, Donald Trump, The List of Bollywood Films 2017 and the United States. Wikipedia reported that got a total of over 15 million views, less than a million short of the views for the entry on the US. 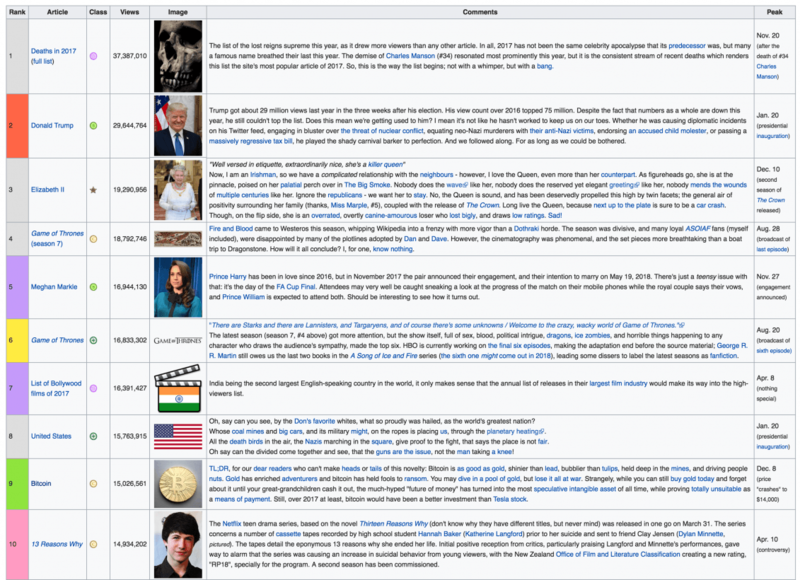 The list shows that BTC was far more read about on Wikipedia than Wonder Woman, 2.6 million more than Dwayne ‘The Rock’ Johnson, Elon Musk, Starwars. As more and more people turn towards the concept of cryptocurrencies and blockchain, more is the urge to know about it. Now with the age of internet and its easy access, people find it more convenient to turn to search engines where they can gather information from an array of websites. All of us know our primary reliability on Wikipedia as a primary source of information, thus it can be considered as a good barometer to validate the BTC popularity.